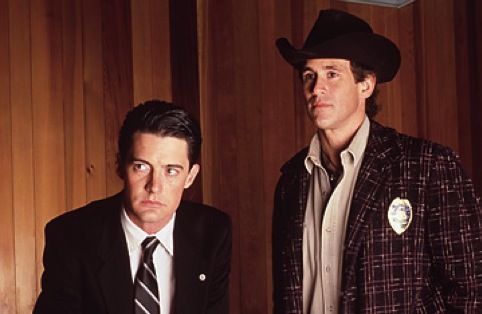 Agent Dale Cooper and Sheriff Harry S. Truman of Twin Peaks. ABC’s most distinctive, offbeat drama series of the past quarter century is getting a makeover. It’s very much an open question whether Lynch is capable of providing definitive “long-awaited answers” to anything. The original Twin Peaks, which premiered in April 1990, flamed out after two seasons in part because of a wildly veering, nonsensical storyline that eventually turned off many of the show’s core viewers. Showtime says it will repeat all of the original Twin Peaks episodes before its remake airs. Or if you have Netflix, you can start watching all 30 of them right now. On the eve of its Wednesday, Oct. 8th launch of American Horror Story: Freak Show, FX announced that series creator Ryan Murphy also will be behind a companion anthology series, American Crime Story. The first 10-episode installment, subtitled The People V. O.J. Simpson, is adapted from Run For His Life by Jeffrey Toobin. There’s no announced cast yet.